Not to be confused with FBI Special Weapons and Tactics Teams. The Hostage Rescue Team (HRT) is the elite tactical unit of the United States Federal Bureau of Investigation (FBI). The HRT was formed to provide a full-time federal law enforcement tactical unit capability to respond to major terrorist incidents throughout the United States. Today, the HRT performs a number of national security and law enforcement tactical functions in high-risk environments and conditions and has deployed overseas including with military Joint Special Operations Command units. The HRT, the Crisis Negotiation Unit (CNU), field SWAT teams, and the Tactical Helicopter Unit (THU), compose the Tactical Section of the FBI's Critical Incident Response Group (CIRG). The Hostage Rescue Team was founded in 1982 by Danny Coulson, former Deputy Assistant Director of the FBI, and completed its final certification exercise in October 1983. It was originally composed of 50 operators, later increased to over 90. FBI HRT agents in June 2006. The HRT was originally conceived during the late 1970s and was set up after FBI director William H. Webster witnessed a demonstration by the U.S. Army's Delta Force.[when?] When Webster reviewed the equipment used by the Delta Force and noticed there were no handcuffs, he inquired about it. An operator grimly replied, "We put two rounds in their forehead. The dead don't need handcuffs." The HRT was originally to be an augmented SWAT and counter-terrorist team, capable of handling extraordinary hostage situations, large-scale counter-terrorist operations, situations involving nuclear or biological agents, or operations that local law enforcement or the regional FBI field office were not trained or equipped to handle. Final approval for the HRT was given in early 1982, and formal planning began in March that year. The initial HRT selection course was held in June 1982 and consisted of three groups of 30 candidates each. 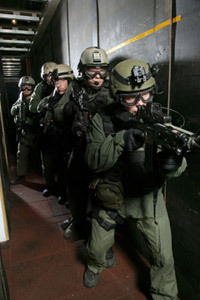 Most candidates were experienced by SWAT team members. Of this group, 50 candidates were selected to continue to more advanced training. Upon completing its initial selection, the newly formed HRT began acquiring the equipment it considered necessary and upgrading training facilities at Quantico. One of its first projects was the construction of a "shoot house", built entirely out of old tires, to allow the team to conduct live-fire training exercises. The final touches were added to the facilities just before Thanksgiving 1982 and, after a short holiday break, the team began its initial training program. After receiving tactical SWAT instruction, each individual was given expertise to research, such as explosives and door breaching tactics. Each operator also served as a liaison to one of the existing elite counter-terrorism teams from around the world. As part of their liaison duties, the men attended training exercises held by their assigned counter-terrorism unit and shared their experiences with the team. The team spent most of January 1983 honing their shooting and tactical skills at Quantico, and then traveled to Fort Bragg, North Carolina, in February for a month of training and instruction with the US Army's Delta Force. The team returned to Quantico for further training. It became operational in August 1983. The team's final certification exercise, codenamed Operation Equus Red, was held in October 1983 at Kirtland Air Force Base, New Mexico. During the exercise, the HRT, a local SWAT team, and a United States Department of Energy Nuclear Emergency Search Team (NEST) were tasked with assaulting a terrorist stronghold. The "terrorist" group was also believed to be in possession of a simulated nuclear device, which was at a separate location and had to be recovered or neutralized. After the NEST aircraft confirmed the location of the device, HRT operators infiltrated the terrorist safe house, secured the device, and managed to "kill" the terrorist involved in approximately 30 seconds. The FBI's senior leadership viewed the exercise as a complete success and granted final approval for the team to become fully operational. Upon completion of the certification exercise, the HRT began to expand its capabilities by sending small teams of operators out for more specialized training courses. Approximately a dozen operators visited Naval Amphibious Base Coronado to receive combat diver, maritime operations, and tactics (such as visit, board, search, and seizure—VBSS) training from the United States Navy SEALs. Other team members conducted helicopter operations and aerial insertion training with the US Army's Task Force 160. Every operator also received 80 hours of medical training. The HRT traveled to Camp Peary, near Williamsburg, Virginia, for counter-terrorism training courses to develop skills in breaching barricades, running roadblocks, and defensive driving. Over time, HRT operators studied with US military, local, federal, and international tactical teams, and attended private courses to learn more about air assault tactics, rappelling, close quarters combat, chemical agents, terrorist psychology, surveillance methods, sniping/counter-sniping, communications and more. Tactics learned during training were shared with the team. Eventually, for close quarter battle training, the HRT decided to make things more realistic on advice from SEAL Team Six (later known as the United States Naval Special Warfare Development Group or DEVGRU) commander Richard Marcinko, and the HRT introduced blood bags and wax bullets. The wax bullets were used for team-versus-team drills. The HRT became part of the Critical Incident Response Group upon its formation in 1994, due to the need to consolidate the assets necessary to respond to a critical incident in one group. The HRT's equipment and tactics are the most advanced of the FBI's 56 SWAT teams and the 14 enhanced SWAT teams. The HRT's capabilities are distinguished because the HRT operators (assault and sniper teams) serve full-time and train daily. While never advertised as such, HRT operators are fully trained commandos on par with Department of Defense special operations units. The HRT has the ability "to deploy within four hours, with part or all of its personnel and resources, to any location within the United States or its territories". The unit is able to operate in a variety of environments (chemical, extreme cold, night and low-light, or rural environments). The HRT's tactical teams have the ability to fast-rope, a technique in which the team rapidly descends a rope from the side of a helicopter. This technique is useful for deploying troops into an area where a helicopter cannot touch down. Even more advanced capabilities are possessed by the HRT, including High Altitude Low Opening (HALO) parachute operations, to name just one. The HRT's capabilities include advanced ground tactics, advanced maritime operations, and advanced tactical aviation operations. The HRT as a whole possesses enhanced capabilities in the maritime domain, including advanced "breaching" capabilities (the ability to circumvent locked doors aboard a ship) and ship-boarding capabilities. The HRT has vessels that are outfitted for maritime assaults, most of which have been upgraded since 2004. HRT also has a specialized maritime team with additional maritime capabilities including subsurface diving, closed-circuit diving (scuba gear that does not emit bubbles), and combat swimming. All operators on the maritime team are military trained in closed-circuit diving and combat swimming. In addition, an operator of the maritime team assault element is qualified to pilot and operate a freighter. The HRT's Tactical Aviation Unit is staffed by FBI special agents. The Tactical Helicopter Unit, a sub-unit of the Tactical Aviation Unit, contains a variety of specially modified helicopters. These helicopters include military converted Sikorsky UH-60 Black Hawk tactical transport helicopters and tactically enhanced Bell 412 and Bell 407 helicopters. Unlike the military, whose aircraft are not always in the same location as their tactical operators, the HRT's Tactical Helicopter Unit is in the vicinity of HRT central command. The HRT's tactical aviators are required to fly daily. Providing force protection for FBI personnel overseas. To a lesser extent, the HRT may deploy teams or individual operators to act as snipers, or to provide protective service details for certain high-profile federal witnesses or dignitaries. Teams provide support for missions overseas and support Joint Terrorism Task Forces. Teams at home and abroad perform typical law enforcement activities, such as making arrests, processing scenes for evidence recovery, and testifying in court. The HRT has provided traditional law enforcement during hurricane relief operations, tactical surveys, and special events such as the Olympic Games, presidential inaugurations, and political conventions. Prospective HRT operators are selected based upon their background and experience, as well as their demonstrated performance during the HRT selection course. The rigorous two-week selection process includes long-distance runs, forced marches, obstacle courses, and other tests of physical and mental stamina. Throughout the entire selection process, candidates are evaluated on their ability to think under pressure and to perform whilst physically exhausted. After a six-month initial training period known as "New Operator Training School" ("NOTS"), they are headquartered at the FBI Academy in Quantico, Virginia. Both the selection course and NOT are near mirror images of the 1st SFOD-D ("Delta Force") selection and training courses, with some minor adjustments for mission differences. Experienced HRT operators assigned to observer/sniper teams are sent to the United States Marine Corps Scout Sniper Basic Course. After successfully completing the course, they receive further instruction from HRT snipers. Maritime platoon operators are sent to a variety of maritime special operations courses, including Phase II of U.S. Navy BUD/S at Naval Amphibious Base, Coronado, California. When not operationally deployed, the HRT conducts full-time training for its members at various sites across the country. Two to three hours each day are set aside for physical training, a defensive tactics session, and combative training. One day a week is devoted to maintaining either perishable skills (such as fast roping, breaching, and photography) or specialized skills (such as mobile assaults, manhunt and rural operations), maritime operations, helicopter operations, parachuting, weapons of mass destruction training (provided by the United States Department of Energy), and cold weather operations. Three days are spent honing sniping or close quarters combat skills on the various training ranges available to the team. Biweekly, one day is allotted for gear maintenance. Discretionary time to be used by team leaders is built into the schedule. During a routine week of training, it is not unusual for HRT operators to fire 1,000 rounds of ammunition to keep their shooting skills honed. Every 12 to 18 months, the HRT also participates in at least one major combined exercise that may involve a variety of governmental entities, such as the FBI and the departments of Defense, State, Energy, and Homeland Security. Three teams rotate through three 120-day cycles: training, operations, and support. During the training cycle, the team refreshes its skills and takes part in exercises, attends other courses, or trains with foreign and domestic units. During the operations cycle, the team is available for deployment (domestic or foreign). During the support cycle, the team works on special projects, maintains the HRT's equipment, and conducts research. The HRT is known to conduct joint training exercises and participate in exchange programs with US military units such as the US Army's Combat Applications Group (otherwise known as 1st SFOD-D or Delta Force) or the U.S. Navy's DEVGRU (SEAL Team 6). The HRT routinely trains with other federal tactical teams such as the DEA's FAST Team, the United States Border Patrol's BORTAC unit or the United States Capitol Police's CERT. Occasionally the HRT trains with French GIGN, British SAS and Special Boat Service, Irish ERU, the Australian SAS, German GSG 9, Italian GIS (Gruppo di Intervento Speciale), and other international units as well as assist in the formation of corresponding units within the NATO framework such as the Hellenic Coast Guard Special Missions Echelons (ΚΕΑ ΛΣ/ΕΛ.ΑΚΤ.). In addition to the HRT's own facilities, the HRT routinely uses private and 1st SFOD-D Delta Force shoot houses and ranges. The HRT has also been known to train at Camp Peary and Harvey Point. Since its inception, the HRT has been involved in many of the FBI's most high-profile cases, executing numerous operations involving domestic militant groups, terrorists, and violent criminals. The first test of the team's capabilities came in the summer of 1984 when the team deployed to Los Angeles as part of the security buildup prior to the 1984 Summer Olympic Games. Some cases have brought the HRT a lot of attention. The HRT came under increased public and Congressional scrutiny, along with federal law enforcement in general, due to what some saw as heavy-handed tactics used at Waco and Ruby Ridge. On the other hand, the HRT has been involved in over 200 successful missions, both in the US and abroad. Many of these operations have received little or no attention from the world press. HRT has been deployed to and conducted combat operations in both Iraq and Afghanistan, for example. The HRT has suffered four known fatalities, all training related. The first was James K. McAllister, who died during a fast rope training exercise in 1986. The second known fatality was Gregory J. Rahoi, who died in a live fire exercise in 2006. In May 2005, an FBI HRT McDonnell Douglas 530 helicopter crashed while conducting a fast rope exercise. Crew members sustained injuries, but none were life-threatening. On May 17, 2013, HRT suffered two fatalities, Christopher Lorek and Stephen Shaw, involving a helicopter while training off the coast of Virginia Beach. The Hostage Rescue Team uses a wide variety of equipment. The HRT's helicopters are operated by their Tactical Helicopter Unit. The HRT can also make use of aircraft belonging to the Critical Incident Response Group's Aviation Special Operations Unit. Danny Coulson: FBI HRT founder and former commander. Later, Coulson became the deputy assistant director of the FBI. Prior to creating the HRT, Coulson served on one of the FBI SWAT teams, more specifically a sniper team, and he later commanded one of the most active SWAT teams in the FBI. As of July 2009, Danny Coulson is a successful security consultant, author, and guest speaker. Lon Horiuchi: Former FBI HRT operator and sniper who shot Vicky Weaver in the head while she was holding her infant daughter during the Ruby Ridge standoff. Horiuchi was also deployed during the Waco Siege. He was later charged with manslaughter for the death of Vicky Weaver, but the charges were dismissed. Christopher Whitcomb: Former FBI HRT operator and sniper. Whitcomb spent 15 years with the FBI and was involved with the Waco Siege, Los Angeles riots of 1992, and Ruby Ridge. As of February 2012, Whitcomb is an American author and appeared as an "expert" on the NBC game show Identity. James K. McAllister: The first of the HRT's four known casualties. Gregory J. Rahoi: The second HRT casualty. Rahoi was accidentally shot and fatally wounded at Fort A.P. Hill in Caroline County, Virginia, during a live fire tactical training exercise designed to prepare him for his deployment to Iraq. Rahoi had been assigned to the HRT for six years, during which he served three tours in Iraq. He worked as a firefighter, paramedic, police officer, and lawyer in Wisconsin prior to joining the FBI. He was posthumously awarded the FBI Medal of Valor for acts of heroism during his final Iraq tour, and his family was presented with the FBI Memorial Star. Thomas R. Norris: Original member of the HRT as an assault team leader. Former US Navy SEAL and a Medal of Honor recipient. Saved Lieutenant Colonel Iceal Hambleton in the infamous Bat-21 mission. He later lost an eye during a mission in Vietnam and was known for being the first HRT member with one eye. HRT operators appear in Silence of the Lambs as they attempt to arrest serial killer "Buffalo Bill" and rescue his hostage. The 1991 film Toy Soldiers depicts a fictional rescue operation carried out by the FBI HRT. In the American political TV drama House of Cards, the Season 4 finale included FBI HRT operators raiding a potential terrorist hideout. HRT units are regularly portrayed in the American TV drama, "The Blacklist"
The film Patriots Day shows FBI HRT operators breaching a dormitory at UMass Dartmouth, where Dzhokar Tsarnaev was believed to be residing. The Disney video game G-Force has FBI HRT operators show up after the first chapter at the Saber Mansion. Despite their uniforms being marked "FBI" and "HRT", they more closely resemble generic SWAT officers. The video games Payday: The Heist and Payday 2 involve federal Hostage Rescue Teams to free civilians that were taken hostage by heisters. ^ "Timeline - FBI". FBI. ^ a b "The Hostage Rescue Team: 30 Years of Service". Federal Bureau of Investigation. February 1, 2013. ^ a b "CIRG - FBI". Federal Bureau of Investigation. ^ a b U. S. Counter-Terrorist Forces. ^ a b c d e "TacLink - FBI HRT". Specwarnet.net. Retrieved 2012-01-14. ^ a b "The Federal Bureau of Investigation's Efforts to Protect the Nation's Seaports". Usdoj.gov. Retrieved 2012-01-14. ^ "The FBI is Home to Some of the Baddest Special Ops Aviators Around". The Tactical Air Network. 23 November 2015. Retrieved 16 July 2018. ^ "Rank and Structure in the Garda Sı´ocha´na and the Role of the Emergency Response Unit". 2006. Barr Tribunal. Retrieved 3 May 2014. ^ "Author Profile: Christopher Whitcomb". Bookreporter.com. Retrieved 2012-01-14. ^ "FBI Agents Were Deployed in Hundreds of JSOC Raids Conducted in Iraq & Afghanistan". Shadowproof. 2014-04-11. Retrieved 2016-06-12. ^ "Inside the FBI's secret relationship with the military's special operations". Washington Post. Retrieved 2016-06-12. ^ Brown, Robbie; Campbell Robertson (2013-02-04). "Standoff in Alabama Ends in Boy's Rescue and Kidnapper's Death". The New York Times. Retrieved 2013-02-07. ^ "Boston Marathon shooting Saturday". CBC News. Archived from the original on September 27, 2013. Retrieved 2016-06-12. ^ "FBI — Statement of Special Agent in Charge Mary Rook on the Rescue of Hannah Anderson". FBI. Retrieved 11 May 2015. ^ "Elite FBI unit rescues N.C. kidnap victim, Frank Arthur Janssen, in Atlanta". 10 April 2014. Retrieved 11 May 2015. ^ "Police seize Eric Frein's food supplies". PennLive.com. Retrieved 11 May 2015. ^ "Federal Bureau of Investigation - FBI History - Hall of Honor for FBI Agents killed in the line of duty". Fbi.gov. 1986-04-19. Archived from the original on 2011-11-16. Retrieved 2012-01-14. ^ "Two FBI agents with Hostage Rescue Team killed in training accident". Fox News. 2013-05-19. Retrieved 2013-05-20. ^ Weil, Martin (2013-05-19). "FBI agents killed in accident in Virginia Beach area". The Washington Post. Retrieved 2013-05-20. ^ "FBI Hostage Rescue Team (HRT)". American Special Ops. ^ Dan Benson (2006-12-16). "FBI agent killed in training devoted life to public safety". JSOnline. Archived from the original on 2011-06-06. Retrieved 2012-01-14. Thomas H. Ackerman, FBI Careers: The Ultimate Guide to Landing a Job as One of America's Finest (2004), ISBN 1-56370-890-6. Danny Coulson, No Heroes: Inside the FBI's Secret Counter-Terror Force (1999), ISBN 0-671-02061-7. Christopher Whitcomb, Cold Zero: Inside the FBI Hostage Rescue Team (2001), ISBN 0-316-60103-9. Wikimedia Commons has media related to Hostage Rescue Team. This page was last edited on 10 April 2019, at 22:26 (UTC).